Forget San Francisco and Chicago. The Legendary Filmmaker’s Collection Belongs in the California Region Where He Was Born and Raised. In California, we have high standards, especially when it comes to development. Whether it’s a new warehouse or an apartment building, the bigger the project, the lengthier and more complicated its gestation. Nowhere is the issue more evident than in San Francisco. Just ask George Lucas. For the past few years, the Star Wars creator has been vying for the opportunity to spend an estimated $700 million to build a museum in the Presidio to showcase his art collection. His museum proposal was one of three for a prime location near Crissy Field that went before the Presidio Trust in February. All three were rejected as inappropriate for the site, currently home to a sporting goods store. Now Lucas—the man who brought American Graffiti and Luke Skywalker to the imaginations of millions of Americans—has turned his focus to Chicago, a city that has embraced his plan with fervor. Chicago Mayor Rahm Emanuel has even picked out a location for Lucas, near Soldier Field on the shores of Lake Michigan. Not to be outdone by potential museum-poachers from the Midwest, San Francisco Mayor Ed Lee has responded with a new location, a city-owned lot just south of the Bay Bridge. It recently became available when the NBA’s Golden State Warriors said “enough” over the lengthy approval process for their own proposed waterfront arena and hotel complex, and took their project elsewhere in the city. Backers say the new site would be an ideal fit for Lucas, and unlike the arena, wouldn’t require lengthy a lengthy permitting process under the San Francisco Bay Conservation and Development Commission and the U.S. Army Corps of Engineers. Even if neither Chicago’s nor San Francisco’s bid comes to fruition, Lucas will have plenty of suitors waiting to welcome his collection of art and Hollywood memorabilia. But what if Lucas took his vision for “the country’s premiere venue for understanding the connections and lineage of illustrative and visual art” and did something truly bold? What if he chose an unexpected home for his vision? Forget the political minefield of San Francisco, which will pick apart everything from the building’s design (too traditional) to its collection (not serious enough). And say “thanks but no thanks” to Chicago, where President Obama seems likely to build a Death Star of a presidential library that promises to outshine Lucas’ museum. Instead, what if Lucas returned to his childhood roots, and to a place that would truly value his collection and its impact? One where his museum wouldn’t be yet another in a long list of tourist attractions, but the centerpiece destination? 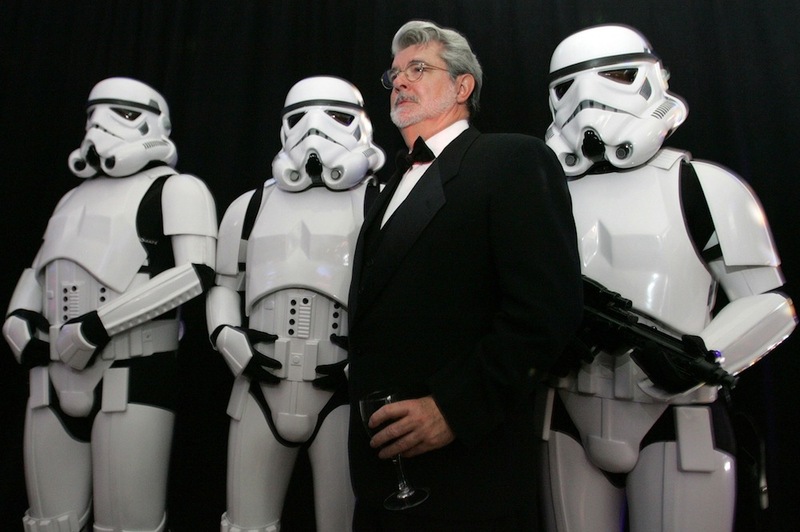 George Lucas: Build your museum here, in the San Joaquin Valley. Lucas’ hometown of Modesto might be the best choice. Last year residents feted their native son with a parade in honor of American Graffiti’s 40th anniversary. Lucas’ Modesto story is one of overcoming challenges; he was in a serious car accident his senior year of high school that he has called a life-changing event, spurring him to enroll in Modesto Junior College and eventually go to USC. Given his personal story and Modesto’s own economic and educational challenges, his vision for a museum dedicated to “the filmmaker’s passion for education and the role art can play in inspiring young people” couldn’t hope to find a more appropriate home. Of course just up Highway 99, Stockton would also be an appropriate destination. A once proud city that for too long has been mired in bankruptcy, it already has a reputation for quietly stealing away coveted assets from San Francisco. Exhibit A: the Google Barge, now docked at the Port of Stockton, after the aforementioned San Francisco Bay Commission booted it from Treasure Island. Even Fresno could put up a strong argument in the case to land the Star Wars museum. The city’s major science and art museum defaulted on a major loan and closed for good at the height of the financial crisis, leaving a massive void in the community and a $15 million debt to the city, which had guaranteed the loan. Fresno is also home to one of the state’s largest urban school districts, where most students will likely never have the opportunity to visit such a cultural institution. Of course, in the world of billionaire producers and art collectors, prestige and glamour will almost always win out over hardscrabble determination and true need. But Lucas’ films are about the triumph of the underdog. And isn’t putting the new Lucas museum in a city that’s already overflowing with them the ultimate example of the rich getting richer? If located in the Central Valley, his museum wouldn’t just stimulate the minds of young people; it would also help give a sizeable boost to the local economy, which is plagued by double digit unemployment. We’ll most likely know soon where Lucas plans to build. And someone as skilled as the legendary director will probably be able to navigate the political and regulatory obstacle course that any Bay Area location would involve, no matter how lengthy. But if San Francisco looks like it will debate the minutiae of his proposal forever, Lucas would be wise to look east to the San Joaquin, where this project would be moved forward at light speed. Joe Moore is the director of program content at Valley Public Radio in Fresno, California.